Department of Viticulture and Enology, University of California, Davis, One Shields Ave, Davis, CA 95616. Aim: There is significant variety in the choice of commercial yeast strains available for wine production. Yeast hybrids represent one class of commercial yeasts. The purpose of this review is to define what yeast hybrids are, to describe how they arise in nature and in the laboratory, and to discuss the features of these yeasts that differentiate them from non-hybrid strains. How does mating occur normally in yeast? What is a hybrid yeast strain? How do hybrid strains form in nature? How are hybrid wine strains constructed in the laboratory? Are natural hybrids of wine yeast found in nature? What are the features of laboratory-generated wine yeast hybrids? What are the impacts of hybrid strains on wine composition? Impact and Significance: Yeast influence wine aroma and flavor profiles in multiple ways1. In addition to the formation of ethanol, yeast can directly produce both positive and negative aroma impact compounds, such as esters, higher alcohols, higher aldehydes, and sulfur-volatile compounds. Some yeast strains can produce factors that enhance mouthfeel, and many can modify varietal aroma through enzymatic and chemical mechanisms. Yeast mannoproteins and polysaccharides may also affect wine stability. Last, yeast end products can alter the wine matrix and therefore the sensory expression of wine characters. Yeast hybrids combine traits of Saccharomyces cerevisiae and other species in this genus, and thereby expand the metabolic repertoire of the strain. These yeasts can create novel characters in wine as well as conduct fermentation under nonstandard conditions. The yeast Saccharomyces cerevisiae is the primary organism responsible for the conversion of grape juice into wine. This species is comprised of many different strains. Strains are individual isolates of the same species that differ in the precise sequence or composition of genes and therefore display nonidentical biological properties. As the genetic composition of different yeast strains varies, so does their impact on wine characteristics. Genetic differences or mutations arise in yeast due to errors in DNA replication or repair. These differences may be benign, lead to loss of function of a gene and protein, alter the function of the protein, create novel functions and activities, or alter the physiological properties of the cell. Other yeast species of the genus Saccharomyces have a different array of chemical products and enzymatic activities as compared with S. cerevisiae, and these species can also be found in association with wines, wineries, and vineyards2. Most of the natural vineyard and winery isolates of the wine yeast S. cerevisiae contain only DNA native to this species2. In microbiology, a species is defined by reproductive isolation, meaning that only the members of the species will mate with each other and produce fertile offspring. Different species within the same genus often share many common genes and properties but display reproductive isolation, meaning that should they mate, fertile offspring are not produced. Occasionally, illicit mating between different species of the same genus will occur and create hybrid strains with novel genetic properties. In order to appreciate how hybrids of different species arise in nature, the process of mating within the species of Saccharomyces will first be described. The Saccharomyces life cycle consists of vegetative growth as either a diploid or a haploid, with diploids being able to sporulate and create haploid spores and cells, and haploid cells being able to mate and re-form the diploid state (Figure 1). This multicomponent life cycle enables genetic exchange between haploid cells and the selection for and against spontaneous mutations that arise in the population. Different genotypes are tested for enhanced fitness in the environment, and those variants that are more fit will dominate. This process allows microorganisms to adapt to new and changing environments. 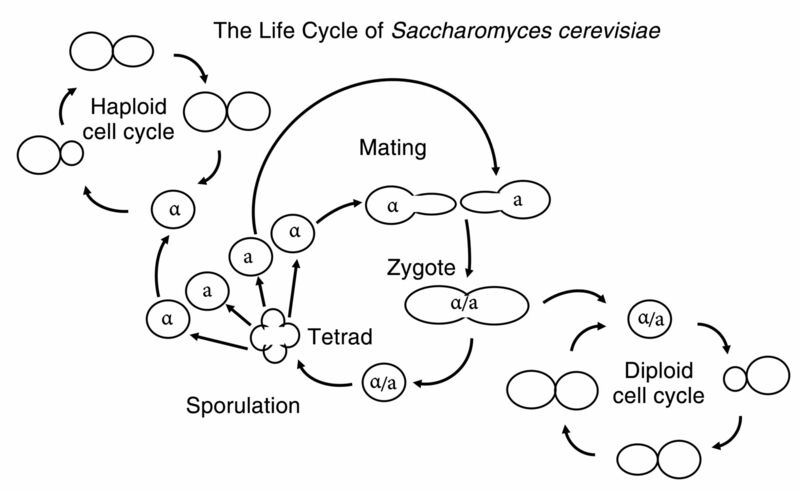 The life cycle of the yeast Saccharomyces cerevisiae. S. cerevisiae can grow vegetatively by budding either as a haploid (one set of chromosomes) or as a diploid (two sets of chromosomes). Haploids exist as one of two mating types, “a” or “α”, and MATa and MATα cells can undergo shmoo formation (directional elongated cell growth) and cell and nuclear fusion events leading to the formation of a zygote. The zygote can grow vegetatively as a diploid. Diploids can undergo meiosis, forming four haploid spores, two “a” and two “α” mating types. There are two haploid states, called “a” and “α”, in Saccharomyces3. When an “a” haploid cell is next to an “α” haploid cell, the two cells will grow toward each other, fuse, and form a zygote, followed by nuclear fusion and the formation of a diploid (Figure 1). Such mating is common in the yeast kingdom and happens regularly. Following cell-surface merger, the cytoplasm initially contains two independent nuclei that then undergo a fusion event. This fusion event reconstitutes the two sets of chromosomes of a diploid (Figure 1). The diploid form may undergo the special process of meiosis or sporulation and produce four haploid spores (Figure 1). Meiosis is the process by which gametes are formed in higher eukaryotes, such as plants and animals. During meiosis, the DNA is first replicated to generate a transient 4N state (with four sets of chromosomes) that can then undergo genetic rearrangements with each other, producing chromosomes with unique assortments of DNA when compared with those in the parent strains. Ultimately, four haploid (i.e., 1N) nuclei are formed, and each is packaged into a unique cell or spore. The released spores may then grow vegetatively as haploids or mate to re-form the diploid state (Figure 1). During this process, the genes in the genome have been reassorted or shuffled, and the spores may express traits not seen in either of the parents4. In some cases, the new cells are more fit for their environment, and in other cases, they are less fit and will be lost from the population. Repeated rounds of vegetative growth, accumulation of mutations, sporulation, and remating yield genetic variety across the population of S. cerevisiae strains found in nature. Thus, the variability seen in wine characteristics as a consequence of yeast strain choice derives from the natural processes of genome change, exchange, and reassortment. Several commercial and native strains of S. cerevisiae are genetic hybrids. A hybrid is defined biologically as an organism that contains genomic DNA from two or more hereditarily distinct parents. Hybrids may arise from the mating of two genetically different strains of the same species, and these strains are called intraspecific hybrids. This type of hybrid yields fertile spores. A second class of hybrids are called interspecific hybrids and arise from the mating of two different species or genera. In the case of wine yeast, interspecific hybrids are the product of the fusion of cells from different species of Saccharomyces4. These hybrids arise naturally in the environment when the two species are present in the same ecological niche under conditions leading to cell-to-cell fusion. Sometimes, hybrid strains may define a unique species. In this case, progenies of hybrid strains are fertile when crossed against other members of the hybrid strain, but not when crossed against other species. A third class of hybrids also exists. These are strains that contain mostly the genome of one species with some stretches of DNA from another species5. Since it is not clear whether these strains are derived from interspecific hybrids with loss of foreign DNA or, alternatively, have picked up DNA from the environment, they are referred to as carrying introgressions, which are large regions of DNA foreign to that species. EC1118 is an example of a commercial wine strain that carries introgressions6. The Saccharomyces genus contains seven non-hybrid and two hybrid species (Table 1)7. The lager yeast S. pastorianus is a natural hybrid of two other species, S. cerevisiae and S. eubayanus, and S. bayanus appears to be a hybrid of three species: S. cerevisiae, S. eubayanus, and S. uvarum, and may have arisen from a rare mating of S. pastorianus and S. uvarum8. Thus, yeast hybrids arise commonly in nature. Recognized species in the yeast genus Saccharomyces7. Hybrids are thought to combine the metabolic properties of the two originating species and therefore may have unique patterns of metabolism and end-product profiles. Often, they can combine desirable properties of the two starting strains, combining in wine yeast a low temperature tolerance of one parent with an array of aroma characters produced by the other. These features would be selected for in the natural environment. For example, a low-temperature-tolerant strain may not produce the array of esters needed to attract insects and disperse the yeast, but a high-ester-producing strain may not be able to grow at low temperature. The hybrid strain would be able to both grow at low temperature and produce insect-attracting ester compounds, and could thus come to dominate the environment. Hybrids can display the trait of one parent (dominant trait), a mixture of a trait (both traits expressed simultaneously, with neither trait being dominant), or a novel trait (trait not found in either parent). Hybrids may be genetically stable as a hybrid and fully maintain both sets of genomes, or may be unstable and lose some of the DNA from one or both parents. Hybrids are generated in the wild when haploid cells of different species mate to form a diploid cell, or if two diploid cells of different species fuse to form a tetraploid cell (4N). Diploid cells normally do not mate with other cells because they already contain two sets of chromosomes. Several naturally arising hybrids of Saccharomyces have been isolated from vineyards4. These hybrids have been isolated at levels higher than would be predicted from simple rare mistakes in mating in the wild. A clue to the origins of interspecific hybrids came from an analysis of yeasts associated with wasps9. Although normally digested in the wasp intestine, viable strains of Saccharomyces can be isolated from wasps, and these wasps are thought to play an important role in dispersal of Saccharomyces in the wild9. Wasps were fed five genetically different strains of S. cerevisiae, each of which carried different genetic mutations, and the wasps were allowed to hibernate in isolation10. Yeasts were harvested from the wasp intestinal tract and evaluated for the evidence of mating. After four months in the wasps, the yeasts exhibited significant outbreeding—evidence of sporulation of the five different strains and mating of the released spores across the five strains, generating intraspecific hybrids. Analysis of yeast from social wasps caught in the wild revealed that interspecific mating can occur as well in this environment. Hybrids of S. cerevisiae × S. uvarum and S. cerevisiae × S. paradoxus were found10. This observation could mean either that the wasps prefer feeding on substances that naturally contain yeast hybrids, or that inter- as well as intraspecific mating occurs in the wasp intestinal tract. To differentiate between these two possibilities, the wasps were fed pure strains of S. cerevisiae and S. paradoxus simultaneously. Over one-third of the wasps developed interspecific hybrids of S. paradoxus and S. cerevisiae, indicating that illicit as well as licit mating occurs within the insect. Interestingly, both the pure S. cerevisiae strains and the pure S. paradoxus strains could no longer be isolated from the wasp intestine at the end of the hibernation period, and only the hybrid strains survived10. Thus, hybrids are better able to adapt to the intestine than are either of the parental strains. This study identifies for the first time the likely location of formation of hybrid yeast strains in the wild. Further, the diversity of fruit substrates present adjacent to vineyards is expected to impact the diversity of yeasts found in wasps as they visit a variety of different food sources. Regions that have a greater diversity of wasp food sources may show, in turn, a greater diversity of interspecific hybrids on grapes at the point of harvest, and this would be an interesting study to conduct. Hybrid strains can also be directly created in the laboratory through a process known as protoplast fusion. In protoplast fusion, the cell walls of two cells are partially digested using specific enzymes, and the cells are then artificially attached to each other via lectins that link two plasma membranes. The plasma membranes then fuse to each other, and the two cells become one (Figure 2). The cell wall is then repaired, and the hybrid cells can undergo cell division and grow. 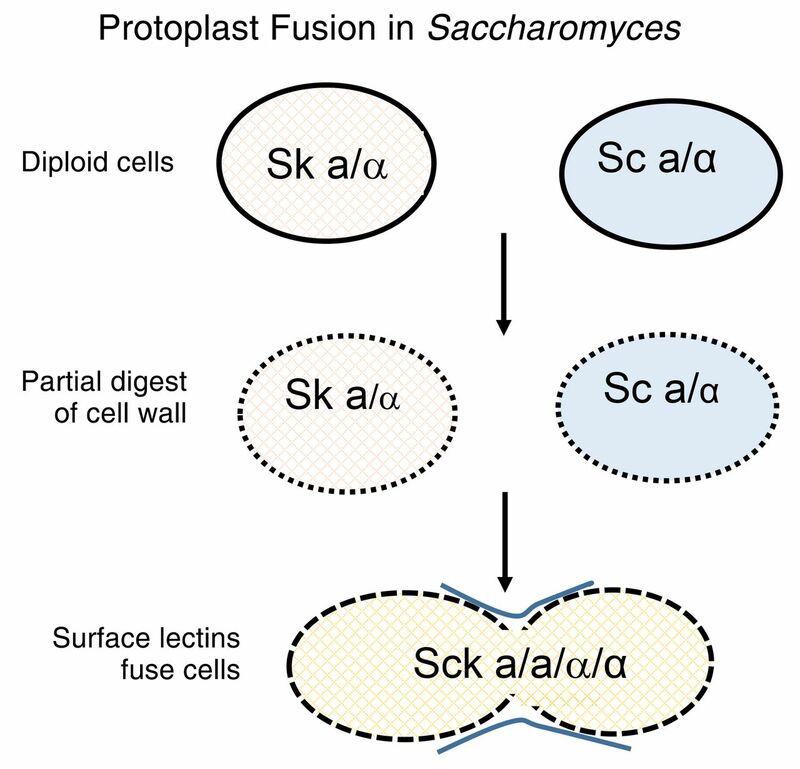 The process of protoplast fusion between species in Saccharomyces. The cell wall is gently digested, leaving an intact plasma membrane. Lectins are used to attach protoplasts to each other, and conditions are maintained that support cell fusion and reconstruction of the cell wall, creating a hybrid strain. (Sc = S. cerevisiae; Sk = S. kudriavzevii; Sck = hybrid of S. cerevisiae and S. kudriavzevii). Laboratory construction of hybrid strains enables mating of more distantly related species or of species not normally found in the same environmental niche. Partial digestion of the cell wall and formation of a protoplast—a cell with an intact plasma membrane—leads to cells sensitive to the osmotic conditions of the environment and that can easily lyse. A similar process of partial digestion of the yeast outer surface may be occurring within the insect intestine, and passage through that intestine may provide sufficient buffering conditions to enable cell fusion and repair9. Triploid and tetraploid strains can also be derived from two different species using protoplast fusion, but are not genetically stable because of the high chromosome number as well as the odd number of sets of chromosomes11. Saccharomyces cells normally replicate and maintain 16 individual chromosomes or chromosome pairs. If the number of chromosomes is greater than 16, the yeast has difficulty replicating all of them during a normal cell division, and some chromosomes may be only partially replicated or not replicated at all. This unstable state leads to chromosome loss, which is often random. If the lost genetic information is not essential for growth and survival, the new cell will be able to continue to grow. In addition, there may be recombination events between chromosomes generating novel or chimeric chromosomes not found in either parent. The traits expressed by these hybrid genomes can be dominated by one of the parents and show traits highly similar to that parent or can be true mixtures of traits of both parents. Thus, the products of protoplast fusion are not genetically stable, and growth of these strains will select for viable survivors that generally have a smaller genome size than that present at the original fusion event. The first demonstration of the hybrid genetic nature of wine strains was published in 199812. The authors used karyotype analyses, partial sequencing, and restriction length polymorphisms to show that some wine isolates were hybrids of S. cerevisiae and S. bayanus. Aside from S. cerevisiae, three species can be found in wine fermentations and winery environments: S. bayanus, S. uvarum, and occasionally S. paradoxus. Hybrids arising from mating events between S. cerevisiae and each of these three species have been found among winery isolates13. Since these yeasts can occupy the same local environment, and there is no prezygotic barrier to cell fusion, the appearance of hybrids among these yeasts in winery environments is not surprising. More surprising was the isolation of hybrids of S. cerevisiae and S. kudriavzevii from wine. S. kudriavzevii was isolated originally from decaying leaves in Japan14. This species had not been found in grape fermentations or in any other type of fermentative process. Hybrids between S. cerevisiae and S. kudriavzevii also have been reported in Europe15. The European parental S. kudriavzevii strain was subsequently shown to be present on oak bark in Portugal and was found in the same locations as S. cerevisiae and S. paradoxus16. Thus, it is thought that the hybrids between S. cerevisiae and S. kudriavzevii arose in non-winery or vineyard environments, and these hybrids carry some selective advantages for fermentations. Sequencing of the commercial wine strain VIN7 (a yeast strain isolated in South Africa) demonstrated that it is an allotriploid hybrid, carrying a diploid set of chromosomes from S. cerevisiae and a haploid set from S. kudriavzevii17. The wine isolates of S. cerevisiae/S. kudriavzevii hybrids have been shown to vary genetically, ranging from diploids and triploids to tetraploids (2N, 3N, and 4N respectively)18, and to be the products of independent hybridization events and sometimes of multiple hybridization events between the initial hybrids and the original parents18. Other scientists have reached the same conclusion that hybrid isolates have arisen from rare mating events between S. cerevisiae and S. kudriavzevii, and that multiple independent hybridizations have occurred, including at least six independent hybridization events for the 26 strains examined in detail17, and the genetic changes associated with these events include chromosomal rearrangements and gene loss19. The observation of multiple independent events giving rise to hybrids between S. cerevisiae and the non-wine species S. kudriavzevii suggests that the hybrids have some traits that are advantageous in wine fermentations. Several researchers have investigated the fermentation characteristics of hybrids of these two yeasts and compared them with those of their parents20. S. kudriavzevii is more cryotolerant than S. cerevisiae, growing well at temperatures below the range that supports growth of S. cerevisiae21. The natural hybrid strains retain this ability to grow at low temperatures, but also express the ethanol and osmotic tolerance associated with S. cerevisiae. Thus, these hybrid strains would be selected for during fermentations at low temperatures. S. kudriavzevii is not competitive as a species in grape juice fermentations, quickly dying off, although the reason for the rapid decline in this species is not known22. Analysis of the lipid composition of the S. cerevisiae/S. kudriavzevii hybrids indicates that their lipid profiles have a hybrid pattern more similar to S. kudriavzevii, thus explaining the greater temperature tolerance of the hybrids than that of S. cerevisiae23. Thus, the hybrids in essence contribute the best of both worlds to cell metabolism and enable a more rapid development of novel phenotypes23. Hybrid strains also show novel phenotypes in aroma production and modification. These strains impact both direct synthesis of aroma compounds and the release or modification of varietal aroma components24. The spectrum of compounds produced was shown to be temperature dependent25, such that non-hybrid strains were thought to have a more appealing aroma profile at higher temperatures. Analysis of regulation of aroma production indicated that the hybrids have unique regulatory mechanisms for aroma production not easily predicted from the parental strains26. Hybrids of various Saccharomyces species can be generated in the laboratory through selection for rare mating events or via the aforementioned protoplast fusion27. In some regions, protoplast fusion is considered a “GMO” technology28, and for that reason, research has focused on mating to generate hybrids in the laboratory. The hybrids initially are simple fusions of the two sets of chromosomes, but selective pressure, especially in grape juice, selects for specific chromosomal loss and rearrangement patterns27. As with the natural hybrids, these laboratory hybrids show different levels of production of aroma compounds and sometimes display levels similar to those produced by one of the parents, but for other compounds, the level can be higher or lower than those produced by either parent29. Much of this work focuses on the same species found as parents in natural hybrid strains, but one study showed hybrids could be made from S. cerevisiae and S. mikatae and provide unique traits and characteristics for wine production30. Novel constructed hybrids may also prove useful commercial strains for the wine industry. The two main positive traits of hybrid strains for winemaking are their greater temperature tolerance and the broader spectrum of aroma compounds produced, either as de novo yeast aroma characters or in the modification and release of grape-varietal characters31. One laboratory study using partially purified fractions of odorless precursors of grape-varietal characters found that interspecific hybrid strains could release more grape aromatic character than non-hybrid strains32. Thus, another important advantage of hybrid strains may be the enhancement of varietal character rather than the production of yeast-derived aroma compounds. Hybrids also offer a distinct advantage over the use of two strains individually in that there is a single strain in a given fermentation, so there is no competition between two different strains. An additional benefit may be the unique profile of compounds produced by hybrids as compared with those produced by their two parents. Hybrids may produce higher or lower concentrations of important aromatic compounds than either of their parents, and this property might be important to the overall wine aroma profile. A study of 212 strains of commercial and native isolates of Saccharomyces in Australia found that there is strong genetic similarity among non-hybrid strains, with roughly one-third of all isolates tested being related Prise de Mousse strains33. In this collection, they discovered only 17 (8%) hybrid strains, 10 of which were hybrids with S. kudriavzevii. The authors speculate that novel characters for wines may come from the use of interspecific hybrids that can bring more metabolic diversity to the production of wine. Interspecies hybrids can thus offer novel metabolic options in winemaking. However, there are always issues to consider before a winery adopts any new strain (Figure 3). Wineries can become colonized by robust fermenters, which can make it difficult for an introduced strain to actually implant in the fermentation. Thus, it is important that the hybrid strain be fully dominant against the native flora of the vineyard and winery. If conditions prevent implantation of the added strain, then it will of course have limited impact on the aroma profile of the wine. Since hybrids perform better at lower temperatures, high-temperature fermentations may be more readily dominated by non-hybrid strains of S. cerevisiae. Potential concerns in the adoption of a novel wine yeast strain. Second, yeast strains vary in their tolerance of wine stresses. These stresses can be caused by inhibitors in the fermentation, lack of ethanol tolerance, or nutrient limitation or excess. Many of our existing fermentation management strategies are tailored to S. cerevisiae. Since S. kudriavzevii does not have the same ability to tolerate the inhibitory conditions found in winemaking22, hybrids may have inherited the reduced tolerance traits from this parent. Genetic stability is also an important factor for hybrid strains. Non-hybrid strains undergo genetic modification, and strains can change over time, but the chromosomal constitution of hybrids can accelerate adaptive responses23. Thus, these strains may continue to change at a more rapid pace than a non-hybrid strain. Fourth, an important question to consider with any strain that has the capacity to dramatically alter the aroma profile is whether you want those specific aromas. The hybrids produce higher levels of the positive fruity esters, and that level of aromatic intensity might not be appropriate for some wine styles. The hybrids can also produce higher levels of the more negatively perceived higher or fusel alcohols31. Last, one attractive attribute of hybrid strains is their ability to enhance varietal aroma via the release or modification of specific grape odorless precursor compounds32. However, these precursors have to be present in the first place in the fruit at harvest. The chemical composition of the grapes may not enable higher levels of production of the desired aromatic compounds. The pH, acidity, and phenolic composition of the juice may affect the appearance of a character by either masking or modifying it in unexpected ways. Thus, the strain may not perform as expected if the chemistry of the matrix is not compatible with the appearance or expression of the desired characters. As with any new tool or technique, it is important to conduct winery trials to evaluate the impact of a potential change in production. It is also important to understand the benefits and limitations of any strain in light of the specific production conditions. Strains that do not have the ethanol or temperature tolerance associated with the initial Brix reading should not be selected. Hybrid wine strains, whether natural or constructed via natural mating processes, are going to offer a host of novel winemaking traits and enhance existing and even add new types of aromas and flavors to the wine. Accurately determining how these strains perform under specific winemaking conditions will be essential for capitalizing on this new source of aroma profile modification. In 10th paragraph of the "Key Themes" section, the word "intraspecific" was changed to "interspecific" in the following sentence: "Over one-third of the wasps developed interspecific hybrids of S. paradoxus and S. cerevisiae, indicating that illicit as well as licit mating occurs within the insect."
. 2012. Flavour–active wine yeasts. Appl Microbiol Biotechnol 96:601–618.
. 2012. Reconstruction of the evolutionary history of Saccharomyces cerevisiae × S. kudriavzevii hybrids based on multilocus sequence analysis. PLoS ONE 7:e45527. doi: 10.1371/journal.pone.0045527. The genes that specify whether a yeast cell is “a” or “α” are called MATa and MATα, respectively. Both genes are simultaneously present in a diploid a/α strain.
. 2012. Double sterility barrier between Saccharomyces species and its breakdown in allopolyploid hybrids by chromosome loss. FEMS Yeast Res 12:703–718.
. 2011. Nature and distribution of large sequence polymorphisms in Saccharomyces cerevisiae. FEMS Yeast Res 11:587–594.
. 2009. Eukaryote-to-eukaryote gene transfer events revealed by the genome sequence of the wine yeast Saccharomyces cerevisiae EC1118. P Natl Acad Sci USA 106:16333–16338.
. 2011. Saccharomyces Meyen ex Reess (1870). In The Yeasts, a Taxonomic Study, vol. 1, 5th ed. Kurtzman C, Fell JW and Boekhaut T (eds), pp. 733–746. Elsevier, Amsterdam.
. 2013. Rapid identification of Saccharomyces eubayanus and its hybrids. FEMS Yeast Res 13:156–161.
. 2012. Role of social wasps in Saccharomyces cerevisiae ecology and evolution. P Natl Acad Sci USA 109:13398–13403.
. 2016. Social wasps are a Saccharomyces mating nest. P Natl Acad Sci USA 113:2247–2251.
. 2008. Interspecies hybridization and recombination in Saccharomyces wine yeasts. FEMS Yeast Res 8:996–1007.
. 1998. New hybrids between Saccharomyces sensu stricto yeast species found among wine and cider production strains. Appl Environ Microbiol 64:3887–3892.
. 2006. Natural hybrids from Saccharomyces cerevisiae, Saccharomyces bayanus and Saccharomyces kudriavzevii in wine fermentations. FEMS Yeast Res 6:1221–1234.
. 2000. Three new species in the Saccharomyces sensu stricto complex: Saccharomyces cariocanus, Saccharomyces kudriavzevii and Saccharomyces mikatae. Int J Syst Evol Microbiol 50:1931–1942.
. 2012. Comparative genomics among Saccharomyces cerevisiae × Saccharomyces kudriavzevii natural hybrid strains isolated from wine and beer reveals different origins. BMC Genomics 13:407.
. 2008. Natural populations of Saccharomyces kudriavzevii in Portugal are associated with oak bark and are sympatric with S. cerevisiae and S. paradoxus. Appl Environ Microbiol 74:2144–2152.
. 2012. The genome sequence of the wine yeast VIN7 reveals an allotriploid hybrid genome with Saccharomyces cerevisiae and Saccharomyces kudriavzevii origins. FEMS Yeast Res 12:88–96.
. 2012. Ecological success of a group of Saccharomyces cerevisiae/Saccharomyces kudriavzevii hybrids in the northern European winemaking environment. Appl Environ Microbiol 78:3256–3265.
. 2012. The molecular characterization of new types of Saccharomyces cerevisiae × S. kudriavzevii hybrid yeast unveils a high genetic diversity. Yeast 29:81–91.
. 2013. Production of aroma compounds by cryotolerant Saccharomyces species and hybrids at low and moderate fermentation temperatures. J Appl Microbiol 114:1405–1414.
. 2012. Lipid composition of wine strains of Saccharomyces kudriavzevii and Saccharomyces cerevisiae grown at low temperature. Int J Food Microbiol 155:191–198.
. 2013. Recurrent rearrangement during adaptive evolution in an interspecific yeast hybrid suggests a model for rapid introgression. PLoS Genetics 9:e1003366. doi: 10.1371/journal.pgen.1003366.
. 2011. Effect of aromatic precursor addition to wine fermentations carried out with different Saccharomyces species and their hybrids. Int J Food Microbiol 147:33–44.
. 2011. Physiological and genetic stability of hybrids of industrial wine yeasts Saccharomyces sensu stricto complex. J Appl Microbiol 110:1538–1549.
. 2012. Evaluation of different genetic procedures for the generation of artificial hybrids in Saccharomyces genus for winemaking. Int J Food Microbiol 156:102–111.
. 2012. Genome-wide gene expression of a natural hybrid between Saccharomyces cerevisiae and S. kudriavzevii under enological conditions. Int J Food Microbiol 157:340–345.
. 2013. Introducing a new breed of wine yeast: Interspecific hybridization between commercial Saccharomyces cerevisiae wine yeast and Saccharomyces mikatae. PLoS ONE 8:e62053 doi 10.1371/journal.pone.0062053.
. 2007. Enological characterization of natural hybrids from Saccharomyces cerevisiae and S. Kudriavzevii. Int J Food Microbiol 116:11–18.
. 2016. Whole genome comparison reveals high levels of inbreeding and strain redundancy across the spectrum of commercial wine strains of Saccharomyces cerevisiae. G3-Genes/Genomes/Genetics 6:957–971. doi: 10.1534/g3.115.025692.